Very few companies in corporate Malaysia have been reshaped, restructured and rebranded as many times as UEM Group. Since the Asian financial crisis in 1997/1998 when the group was reeling from massive debt, the sprawling diversified conglomerate (then called Renong Group) has been sliced and diced into various entities based on core activities. Earlier, UEM World had disposed of its entire shareholdings in four listed companies, namely UEM Builder Bhd, Pharmaniaga Bhd, Opus Group Bhd and Cement Industries Malaysia Bhd, to its shareholders as part of the restructuring plan. It subsequently reorganised its shareholdings in its wholly owned subsidiary, UEM Land Bhd, via a dividend-inspecie and capital repayment exercise. This involves the offering of five UEM Land Holdings shares for every four UEM World shares held and RM1.26 cash for each UEM World share held. Wan Abdullah: Sales are slow but there are still buyers. Post-listing, UEM Land Holdings will be 77.1%-owned by UEM Group and 22.9% by the public. On the public shareholding spread falling short of Bursa Malaysia’s requirement of 25%, UEM Land Holdings managing director Wan Abdullah Wan Ibrahim reveals that the company has been granted a time extension by the bourse to meet its requirement. An analyst with a foreign research house views the restructuring of UEM World as a strategic move to generate investors’ interest. According to him, UEM Land appeals to investors because it owns a vast land bank in Iskandar Malaysia, which is one of the country’s economic growth corridors under the Ninth Malaysia Plan. UEM Land currently owns about 40% of the total land area in Nusajaya. Spanning a total of 23,875 acres, Nusajaya has been identified as one of the five flagship economic zones in Iskandar Malaysia. It is currently under various stages of development to be transformed into an integrated township, with completion expected to be in 2030. “Previously, the bulk of UEM World’s valuations were derived from UEM Land’s tract in Nusajaya,” the analyst explains, adding that investors who bought UEM World’s shares were actually capitalising on the potential appreciation of the land value. However, he says that at this juncture it is hard to justify as to whether the indicated reference share price for UEM Land Holdings is a fair value. He attributes this to the concentration of UEM Land’s business activities in Nusajaya and the lack of historical earnings guidance for its projects there. Although the prevailing poor market sentiment is likely to depress the reference share price of UEM Land Holdings further when it make its debut on the stock exchange next week, Wan Abdullah remains unfazed. He is convinced that the potential income generated from UEM Land’s businesses in Nusajaya and the company’s upcoming projects in other growth areas will be the future determinant of the share value of UEM Land Holdings. “We view our ongoing projects in Nusajaya as machinery to crank out sustainable revenue streams for the company,” says Wan Abdullah in an interview. 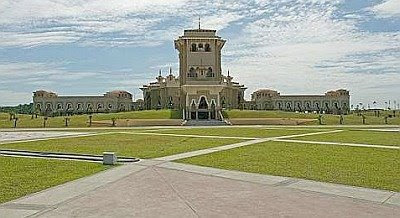 UEM Land is the main developer of the township, given its large presence in Nusajaya. Among the projects under its belt are the Johor state new administrative centre, Puteri Harbour Waterfront Precinct and several high-end residential enclaves as well as commercial and industrial estates. The Johor State New Administration Centre is one of UEM Land’s catalyst projects in Nusajaya. According to Wan Abdullah, UEM Land will bank on the diversity of its product offerings at Nusajaya, which target various market segments, to deliver consistent sales in the challenging economic climate ahead. “There is no doubt that buying activities are going to slow down and we are bracing ourselves for the challenges ahead. However, we believe there are still buyers, particularly from the affluent market, who would be interested in investing in our projects,” he says. “We believe we could steer out of this turbulence with sweet success as we have a wide and diversified market from which to tap,” he adds. Nusajaya’s strategic location close to Singapore and its easy access to various facilities, including two international airports and five seaports as well as a comprehensive network of roads and expressways, will add strength to the company’s projects. Homes at East Ledang high-end residential precinct come with exclusive designs. To date, UEM Land has recorded encouraging sales for its Nusajaya projects. For instance, its four high-end residential developments – namely Nusa Idaman, Horizon Hills, Ledang Heights and East Ledang – have recorded take-up rates of 59% to 84%. Wan Abdullah says most of these buyers are foreign investors, with the bulk of them coming from Singapore. He adds that the company continues to see a growing interest among foreign investors, particularly from the Asia-Pacific and Middle East regions, for its projects, thanks to its aggressive international marketing. 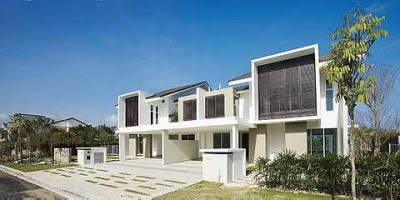 Meanwhile, it is understood that the company’s appeal for the relaxation of the quotas imposed on foreign home ownership is still under consideration by the Johor government. Currently, the quotas for foreign home ownership are 20% for residential and 50% for resort-type projects. Wan Abdullah reveals that UEM Land’s projects are proceeding as planned despite the worsening financial crisis over the past few months threatening to lead to a global recession. He says the company is now at the final stage of negotiations with a consortium of local bankers for the financing of its projects in Nusajaya. UEM Land also seeks to form more strategic partnerships to increase the development pace in Nusajaya. The company already has partnerships with two Middle East property developers – Limitless Holdings Pte Ltd and DAMAC Group – and three local players – Crescendo Corp Bhd, Gamuda Bhd and United Malayan Land Bhd – for its various projects in Nusajaya. Wan Abdullah says the company’s strategic partners were selected based on several criteria established by its board. This includes having a wide market outreach and possessing the technical and financial capabilities for real estate developments. Going forward, UEM Land will diversify its business with development projects in other growth areas such as the Klang Valley and Penang. According to Wan Abdullah, the company is also exploring other options to grow its business and that includes acquisitions of strategic buildings for leasing purposes and REITs. On the company’s plan to expand overseas, Wan Abdullah says the management has adopted a cautious stance because “the current climate is not looking good”. He says the company does not have the capacity currently to expand overseas but it will look into such a possibility probably two years down the road when the economy improves. Regional healthcare provider Columbia Asia, which currently operates five community hospitals in Malaysia, is investing about RM225 million in three new hospitals here. Once completed by 2010, the company will have a total of 11 hospitals nationwide since the launch of its first hospital in Seremban in 1994, said chairman Rick Evans yesterday. Close to 60 per cent of the total cost of the three hospitals is being financed through bank loans while the rest is from its various private equity owners. In Malaysia, the Employees Provident Fund (EPF) holds 30 per cent of Columbia Asia Sdn Bhd. Evans told reporters this after the signing of a RM116 million syndicated Islamic loan with Bank Rakyat, RHB Islamic Bank Bhd and Bank Muamalat Malaysia Bhd in Kuala Lumpur yesterday. "This financing will only part-finance the construction of the three hospitals and the rest will be raised from our investors," he said. Columbia Asia is the Asian entity for Seattle-based investment and money manager Columbia Pacific, which recently raised a total equity of US$325 million (RM1.17 billion) in its second round of financing for its Asian operations in four countries, including Vietnam, Indonesia and India. In Malaysia, apart from the three new hospitals to be built, three others are now under construction. The six new hospitals are in Balakong, Bukit Rimau, Kota Damansara, Nusajaya, Setapak and Bintulu. By 2010, Columbia Asia will have 21 hospitals and an airport clinic in India, 11 hospitals here, three in Vietnam and three in Indonesia, together representing an investment of over US$600 million. "We are looking at expanding to the Philippines," said Evans, adding that the healthcare business is not affected by any economic downturn. Unlike some hospitals, Columbia Asia is not interested in medical tourism. "Malaysians used to go to Singapore for treatment some time back and now they prefer to stay home. Indonesians now come here but we believe that not so long from now, they will prefer to stay in their country too," he said. Evans said Columbia Asia aims to be the preferred choice for employers, insurance companies and families. Some 60 per cent of the company's revenue in Malaysia was contributed by third-party administrators like companies and insurers. Columbia Asia hospitals make about RM3 million a month in revenue and a new hospital usually breaks even in a year. SHAH ALAM: Advance Synergy Bhd, which manages 17 hotels and resorts, plans to increase the number of such properties as it seeks to make this segment the core business, executive chairman Datuk Ahmad Sebi Bakar said. “We are now trying to increase the (property) management sites. Instead of buying hotels, we want to manage other people’s hotels. “That is the next step that we are trying to push ourselves forward,” he said after the company EGM yesterday. However, the group would rather not invest in property but manage hotels for other parties, he added. Of its 17 hotels and resorts, eight are in Malaysia and nine are overseas. Earlier, ASB shareholders approved the acquisition of the remaining shares in its 75%-owned Advance Synergy Capital Bhd at 60 sen per share and the subsequent delisting of the latter. “It is better for them (shareholders) to realise their investments at the current offer price and see how to invest again when things get better and clearer,” he added.